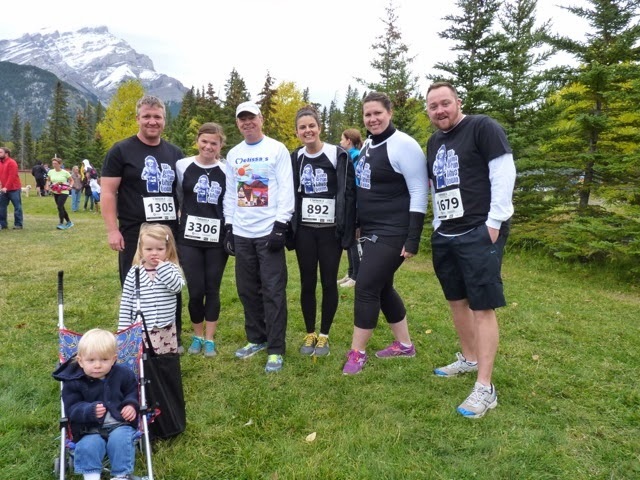 Another fabulous run in the mountains this year. We added a few to our group, including Jeff! Well, frozen we were since the temperature had dropped significantly compared to last year. I had a Mama guilt moment as I watched children in snowsuits walk by my two dressed as shown below. They're hearty though and, thanks to Gram and our friend Steve, took a trip to McDonald's to warm up during the run. After cheering us on a little first and snapping this shot, that is. There really isn't a better road race than Melissa's. 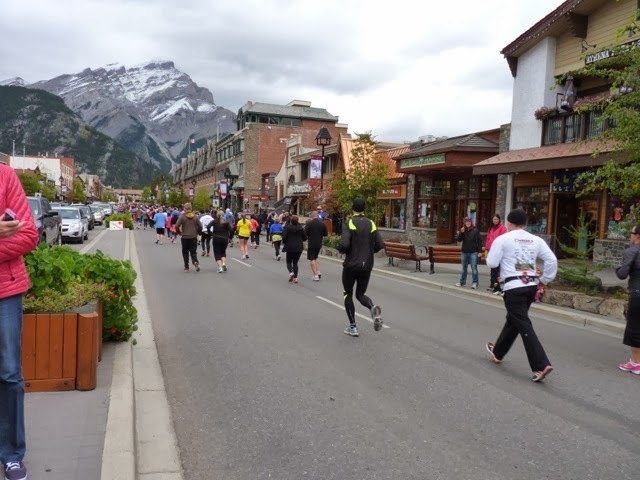 You start the run down the main street of the gorgeous mountain town of Banff. And what would a mountain run be without a mountain right? We certainly got one, from about kilometers 2 to 4.5 actually. The consolation being that after this you get a whole lot of downhill. 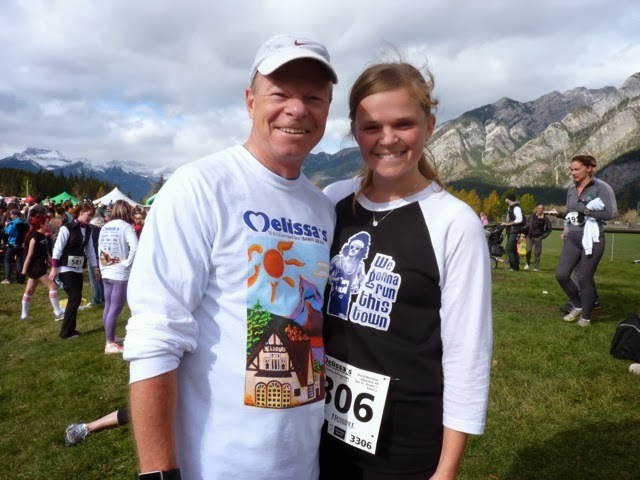 I was so glad to run with my Dad this year and hope to make it a tradition. Has the pain of the mountain worn off enough to commit Dad? I was ecstatic with my time as I beat my personal goal by a whole minute. As proud as I was of myself, it paled in comparison to my pride in this guy. 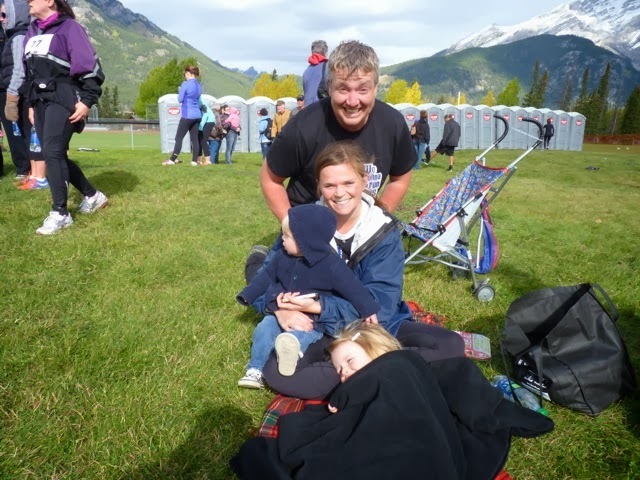 The husband ran 10 kilometres and lived to tell about it. What seemed like an impossibility just a couple months ago was accomplished. His stubbornness determination floored me but I really shouldn't be surprised. Jeff can do anything he sets his mind to. He has completely transformed himself physically in the last 7 months. In doing so he has also vastly improved the life of our family. His energy, capabilities and confidence have skyrocketed. I think the main difference is that, though we've always known how great he is, he's actually starting to believe it.